The Browse page is located on the top menu. It shows all the documents uploaded into the case you are currently working on. This page also allows you to edit/delete documents. If you need to find specific documents based on the text or keywords search, please open the Search page. To select documents and perform multiple document operation please visit to our Shared Functions page for more details. To learn more about those features, please visit to our Uploading Folder Structures page for more details. This function is available under the 'Search' and 'Browse' pages, and allows you to quickly and accurately sort documents for what you need, involving several levels of visual discrimination. When you click on 'Select Sort' link a new window will be opened. The date formatting convention entered under the date fields (e.g. Date Created) should not matter, as Lexbe eDiscovery Platform parses a date string and returns results in a way that does not affect the sort order. 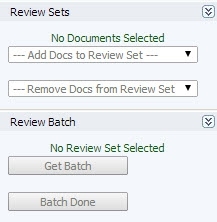 Maximum Review Set Size - the maximum number of documents in a Review Set is determined by the Admin User. To learn more about the features below, please visit to our Shared Functions page for further details. If you are having difficulties opening or viewing documents in the document viewer, see Document-Viewer-Troubleshooting.